Botox in Atlanta, performed by our team, is a non-invasive facial rejuvenation procedure used to lessen wrinkles around the eyes and on the forehead. Botox injections will not address sagging or drooping skin, but for those people looking to tackle “crow’s feet” or “worry lines” it could be exactly what you are looking for. Botox works by addressing the muscles that have tensed over the years and are causing your skin to wrinkle. The injection causes the muscles in the face to relax, thereby allowing the skin to smooth back to its natural state. This newly smoothed surface rolls years off your face without the need for costly surgery and a lengthy recovery. You have fine lines (often referred to as “crow’s feet”) around your eyes. You have lines from your nose that extend downward (often referred to as “laugh lines”). You have lines or wrinkles around your mouth (often referred to as “frown lines”). You have lines or wrinkles on your forehead. Getting answers to the aging issues outlined above without the need for surgery or a lengthy recovery has made Botox a popular facial rejuvenation option for many men and women. Atlanta Plastic & Reconstructive Specialists offers a team of board-certified plastic surgeons to serve you. All of our doctors have years of education and experience! In case that wasn’t enough, Atlanta Plastic & Reconstructive Specialists offers the only triple board-certified plastic surgeon in the United States. You are a person, not a procedure! Our doctors take the time to get to know the clients and fully understand their goals for cosmetic surgery. A person’s happiness comes first, that is why you’ll never be rushed through haphazardly. Atlanta Plastic & Reconstructive Specialists is dedicated to safety. They use only the finest materials and modern techniques to ensure you the highest quality as well as top-notch safety. To ensure further safety of clients, the office is located in the medical office building of St. Joseph’s Hospital, Atlanta’s premiere medical institution. 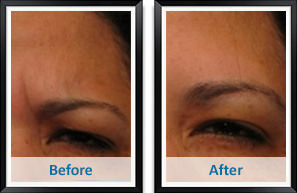 Unlike a face or brow lift, a Botox cosmetic treatment is done right in your plastic surgeon’s office. Once a patient schedules their appointment, the doctor will prepare the injection fresh for the incoming client (Botox’s potency begins to fade after 12 hours of preparation). During the procedure the doctor will give small shots of Botox Cosmetic to the patient through facial injections. Each small dose loosens the muscles in a small area. Once all of the muscles in the “trouble” area have been treated, the skin will begin to relax and wrinkles will fade away. Patients who receive Botox Cosmetic treatments in Atlanta have been known to see results in as little as a few days, but it generally takes up to two weeks to see the full benefit of your Botox treatment. If you are interested in finding out how you can receive discounts on treatments in the future, ask about Allergan’s Brilliant Distinctions Program! Each person is unique and determining whether Botox Cosmetic is right for an individual, as well as the potential risks associated with the treatment, can only be determined during a consultation. Regardless of the type of cosmetic procedure (surgical or not), there is always some kind of risk. There have been cases of minor complications occurring that do not have any adverse effect on the outcome of the procedure. Reading this website can be informative, but is not a substitution for a proper consultation!